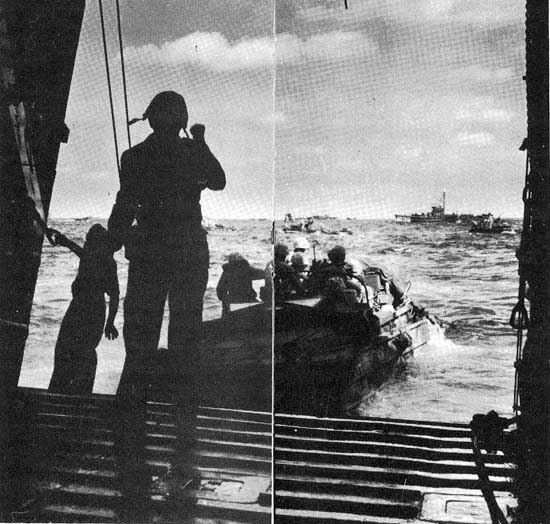 DUCK loaded with Marines takes off from Coast Guard manned LST at Iwo Jima. BIGGER than ever in its history, the U. S. Coast Guard is observing its 155th anniversary this month after completing its busiest year. An arm of the Navy since shortly before Pearl Harbor, the Coast Guard has carried out assignments in World War II that has taken its forces to battle fronts throughout the world. It has participated in all the major invasions, transported thousands of troops to battle zones and played an active role in the Navy's anti-submarine operations. 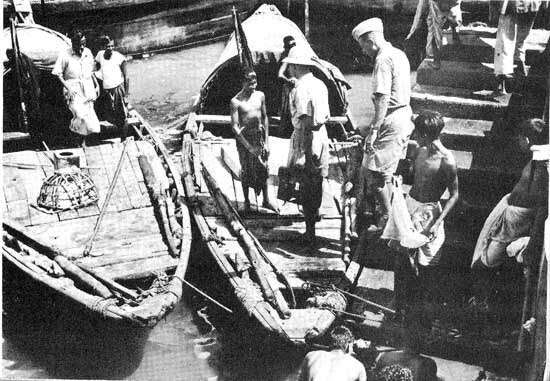 While performing these wartime jobs, it also has continued peacetime functions vital to the war, such as merchant marine shipping inspection, port security, life saving and maintenance of aids to navigation. Not the least important of its duties is the saving of life at sea. 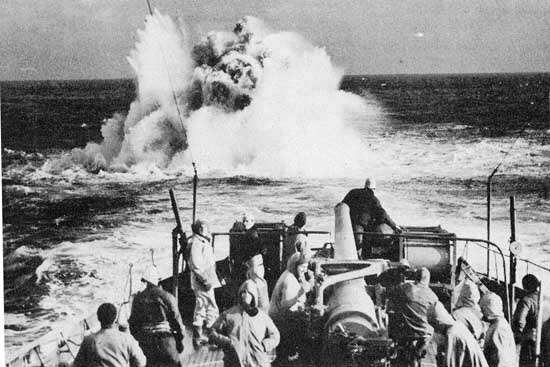 This activity is now combined under the Coast Guard-commanded Air Sea Rescue Agency set up 15 Feb. 1944 by the Secretary of the Navy at request of the Joint Chiefs of Staff. Admiral R. R. Waesche, commandant of the Coast Guard and its first four-star admiral, is chairman of the inter-service board which directs the agency's activities. Air Sea Rescue task units, comprising planes and fast rescue boats, are operating not only along the coasts of North America, but in all war theaters. INVASION of southern France was first big action in Coast Guard's 155th year. 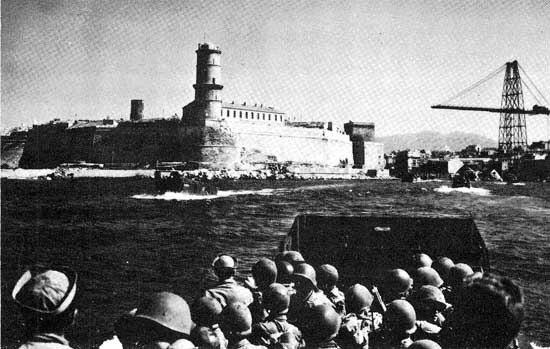 Coast Guard LCs (above) were among naval craft entering Marseilles. 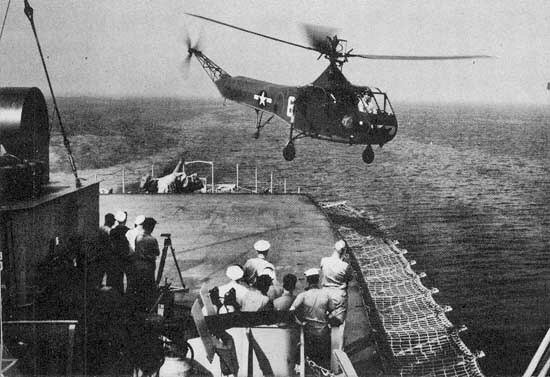 COAST GUARD CUTTERS in 1944-45 saw the end of the Baffle of the Atlantic (above) and experiments in use of helicopters (below) in air-sea rescue work. The agency is constantly studying and improving techniques and equipment. Particular attention is being given to development and use of the helicopter in rescue work. In May this year one of these ingenious machines plucked nine Canadian flyers from a remote region of Labrador after their plane crashed. Another was used for reconnaisance during the Mississippi spring floods. Air-sea rescue experiences gathered during these war years will prove invaluable in the postwar era when a vast expansion of coastal and transoceanic air travel is anticipated. In peacetime the Coast Guard is part of the Treasury Department. It was founded 4 Aug. 1790 when President George Washington signed an Act of Congress inspired by Secretary of the Treasury Alexander Hamilton creating the Revenue Marine. 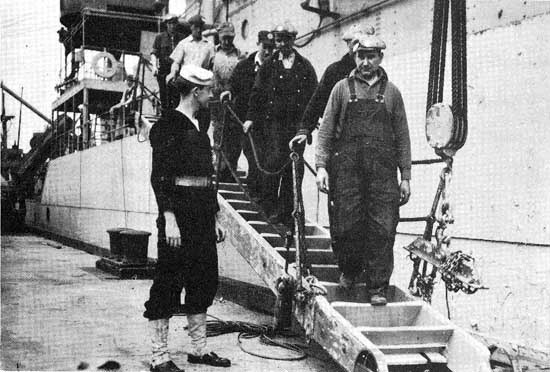 The name later was changed to Revenue Cutter Service and then in 1915, when this service was merged with the Life Saving Service, the new organization became the U. S. Coast Guard. Its wartime strength totals 171,931 which includes 10,162 commissioned male officers, 878 commissioned Spar officers, 1,632 warrant officers, 150,094 male enlisted personnel, 8,846 enlisted Spars and 319 cadets. 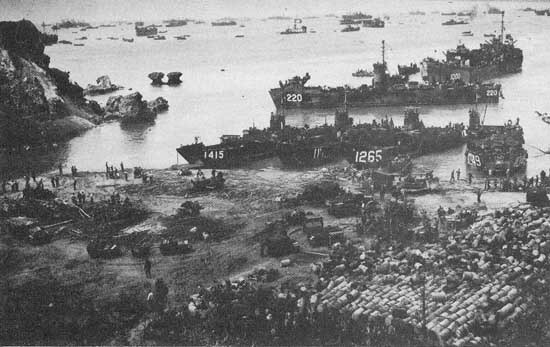 OKINAWA invasion was another of the year's big operations in which Coast Guard-manned vessels participated as part of huge amphibious assault force. FARFLUNG AND VARIED are tasks Coast Guard performs - for example, port security (above) and Merchant Marine hearing units around the world (below).